Huntington is a community transitioning from a purely industrial economy to a services and academic hub with major institutions such as Marshall University. 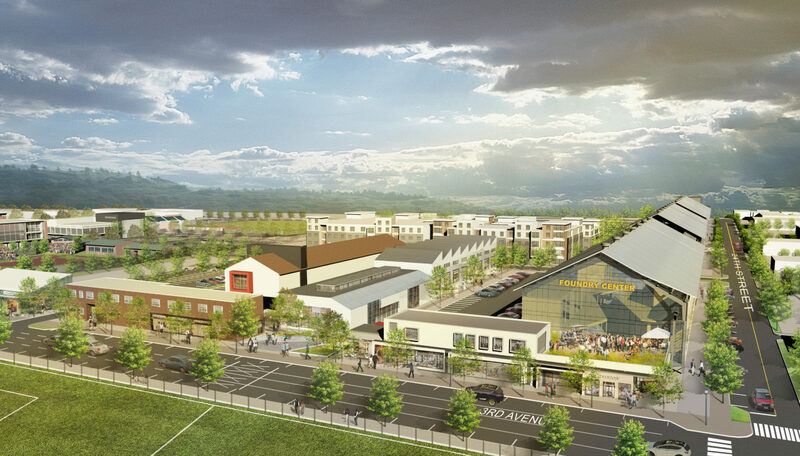 SGA developed a mixed-use brownfields reuse strategy that greatly expands the economic potential of the city through the creation of high tech and academic expansion on to three large post-industrial sites. SGA was retained by the City of Huntington to develop a comprehensive strategy for three strategic brownfield sites. 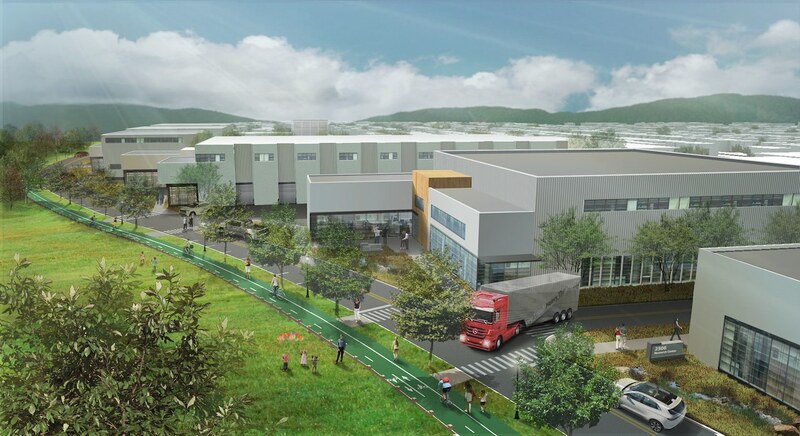 Branded “the Huntington Brownfields Innovation Zone” the strategy needed to focus, not on a parcel-by-parcel approach that limited its full economic impact, but a comprehensive strategy that links the Highlawn neighborhood with Marshall University’s campus and the city’s vibrant downtown. SGA’s plan focuses on entrepreneurship, job creation, strategic neighborhood reinvestment, and redefining the City as a destination for arts, culture, and a rich quality-of-life. 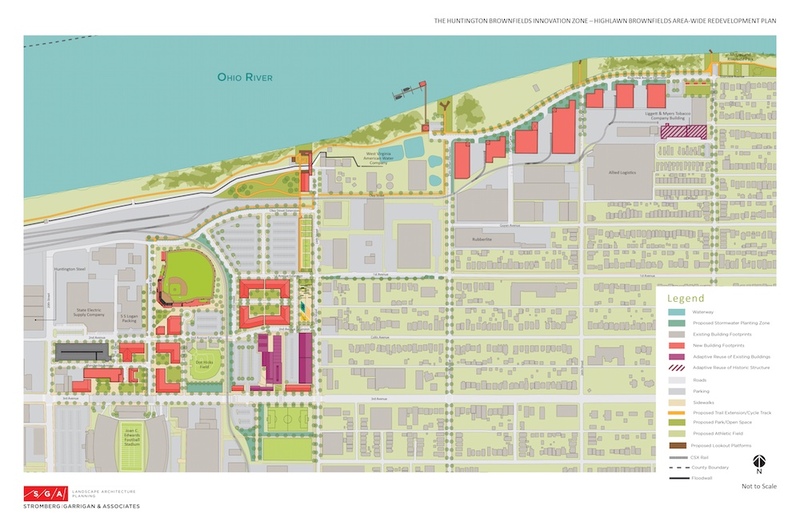 It proposes a series of distinct development zones each anchored by a major use, including a hotel and conference center, minor ballpark, signature public spaces, and high-tech research and production facilities. All of these development zones are linked to the Ohio River through the creation of new trails and parks. A major focus of the design is the integration of green technology into all aspects of development including public infrastructure, public spaces, and private land development. The City of Huntington suffers from major flooding issues because of secondary impacts of a major Ohio River floodwall project constructed in the 1940s. The Highlawn neighborhood sits in a bowl that regularly floods as a result of stormwater runoff backing-up in the conveyance network behind the floodwall. SGA is serving as the prime consultant for the U.S. EPA funded Brownfields Area-Wide Plan and Brownfields Hazardous and Petroleum Assessment grant projects.